Yury Gogotsi, Ph.D., Distinguished University and Bach professor in Drexel's College of Engineering, Department of Materials Science and Engineering, who studies the applications of new materials in technology, suggests that the ink created in Drexel's Nanomaterials Institute is a significant advancement on both of these fronts. While researchers are steadily figuring out ways to make inks from new, more conductive materials, like nanoparticle silver, graphene and gallium, the challenge remains incorporating them seamlessly into manufacturing processes. Most of these inks can't be used in a one-step process, according to Babak Anasori, Ph.D., a research assistant professor in Drexel's department of Materials Science and Engineering and co-author of the MXene ink research. "For most other nano inks, an additive is required to hold the particles together and allow for high-quality printing. Because of this, after printing, an additional step is required—usually a thermal or chemical treatment—to remove that additive," Anasori said. "For MXene printing, we only use MXene in water or MXene in an organic solution to make the ink. This means it can dry without any additional steps." 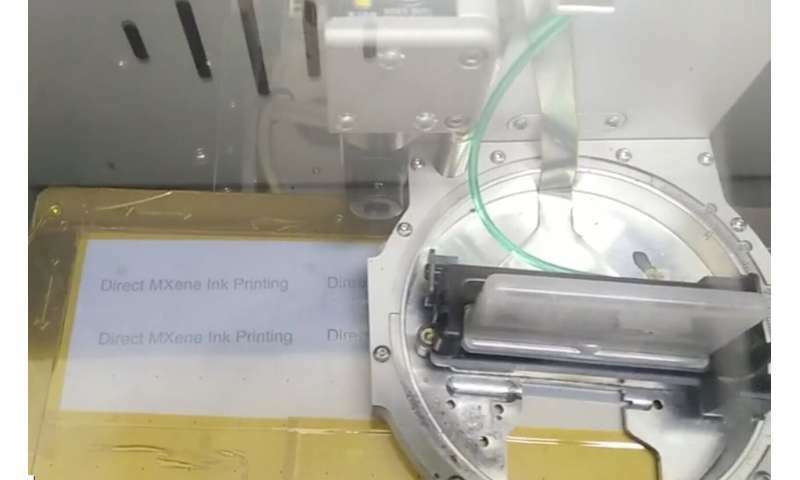 As part of the study, the Drexel team, working with researchers at Trinity College, who are experts in printing, put the MXene ink to the test in a series of printouts, including a simple circuit, a mirco-supercapacitor and some text, on substrates ranging from paper to plastic to glass. In doing so, they found that they could print lines of consistent thickness and that the ink's ability to pass an electric current varied with its thickness—both important factors in manufacturing electronics components. And the printouts maintained their superior electric conductivity, which is the highest among all carbon-based conductive inks, including carbon nanotubes and graphene. This all amounts to a very versatile product for making the tiny components that perform important, but often overlooked functions in our electronics devices—jobs like keeping the power on when the battery dies, preventing damaging electrical surges, or speeding the charging process. Providing a higher-performing material and a new way to build things with it could lead not only to improvements to our current devices, but also the creation of entirely new technologies. The only question I have is "How expensive will it be once it is mass produced?"